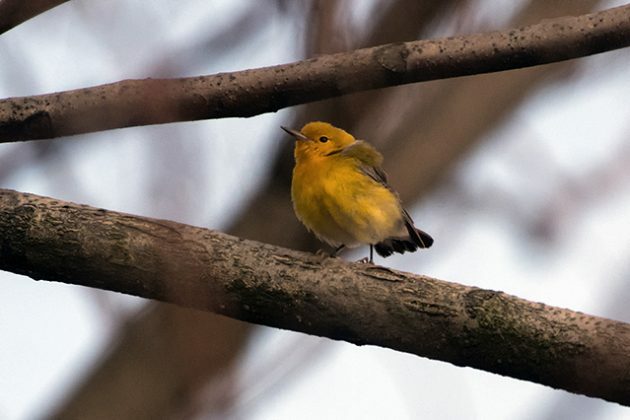 The story begins with a Prothonotary Warbler found in Brooklyn by Gabriel Willow, a NYC birder, on Wednesday, April 12th. A happy circumstance, but not an unusual one. One or two, sometimes even three or four Prothonotary Warblers show up in New York City every year, often in migrant hotspots like Central Park or Prospect Park, sometimes a little off the beaten path, like the Prothonotary Warbler that spent several weeks on the New York Public Library steps (two weeks before it was discovered by birders) in October 2010, earning an article in the New York Times and a visit from Corey and Desi. This Prothonotary Warbler was observed at the Salt Marsh Nature Center at Marine Park, Brooklyn, a place I knew from previous twitches and a relatively easy drive if it isn’t rush hour and if there are no accidents on the Belt Parkway. I had spent Thursday morning looking for my own Prothonotary at Alley Pond Park and, finally admitting defeat, I arrived at the Nature Center in the early afternoon. It was a beautiful April day, and the park—part salt marsh preserve and part recreational—was crowded with families celebrating the holiday week. I walked to the patio at the back of the Nature Center, easily found the members of our tribe amongst the more recreational visitors, and looked at the rocks that led down to the wrack line of the cove. “No,” I was told, “Look down. No. No. Closer.” Yes, it was one of those rare birds that is foraging right in front of you, in this case in a bed of small purple flowers, too close to photograph. 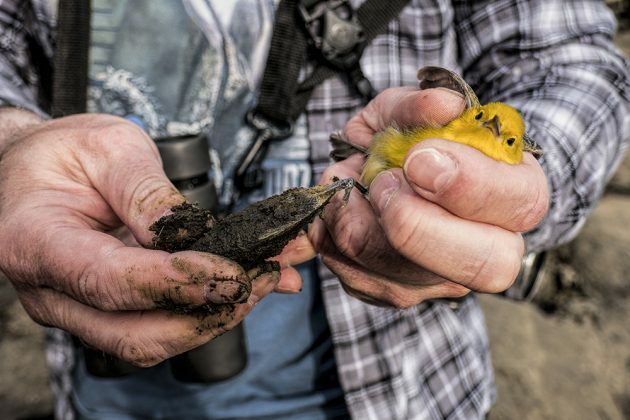 I adore Prothonotary Warblers, ‘living lemons,’ as my friend John calls them, brilliant balls of golden yellow with blue wings and lively black eyes, usually found in southeastern swamps or bottomland hardwood forests. Settling myself on top of the low wall bordering the patio, I observed the bird as he fed off the purple flowers, amazingly disappeared within them for long periods of time, hopped/flew down to the rocks and then back again. Then, for no discernible reason, the bird flew! Not far, we tracked him to the area next to the Nature Center, where the cove ends against a wall of large rocks that rise up 20 feet or so to the sidewalk. Peering over the fence, next to the ‘don’t climb the rocks’ sign, I observed the bird bathing in a small stream of water and left him there. I had a salt marsh to explore, Marsh Wrens to listen to, and Osprey to observe (nest-building, copulating, and fending off harassing crows, but that’s a different story). But, danger lurked in those slippery rocks. Early evening I returned to the Nature Center. A group of newly arrived birders were searching for the Prothonotary, missing in action. 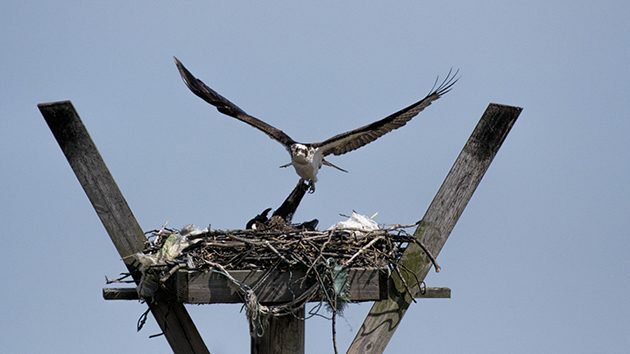 Fortunately, Eric Miller and Lisa Scheppke, Queens birding colleagues, arrived and quickly re-located the bird near where it had been bathing earlier. I was across the cove by some fishermen (apparently, one could be on the rocks there) and could see the birders standing on the sidewalk, heads down, observing the warbler on the rocks. And, then I saw Eric scrambling down the rocks. And, a staff member from the Nature Center running out to tell him not to climb down those rocks! And, Eric saying something about rescuing a bird! What bird? My immediate thought was that Eric was going to help out a nearby Mute Swan with some weird feathers sticking out, but that seemed odd. I ran over the rocks, thankful I was wearing non-slip hiking boots, to where Eric was retrieving the Prothonotary Warbler from between two rocks. Lisa had climbed down too, and the Nature Center worker had gone for tools. The warbler had gotten stuck. It wasn’t until Eric carefully picked up the bird that we could see that it hadn’t been trapped in a rock crevasse, the expected problem. The bird’s toe was stuck in a mussel. More than stuck, the mussel had clamped down on the bird’s toe and wouldn’t let go. It was as if the toe was in a vise. I suppose that if this was a larger bird it could have walked away with the mussel on its toe, but this was a Prothonotary Warbler, 14 grams in weight, and the mussel had essentially crippled him. The Nature Center worker brought down pliers and Eric gave the bird to Lisa to hold as he examined the situation. Here was an ethical dilemma: The bivalve or the warbler? One of them had to be injured, possibly killed. It didn’t take long to come up with an answer, especially as the bird was not very happy and the mussel didn’t articulate an opinion. Eric quickly opened up the bivalve with the pliers and released the toe. The bird fussed. Eric’s hands were covered with mussel gook. Eric, Lisa, and the staff worker looked the bird over. The toe was still there and did not appear to be damaged. Sighs of relief, all round. Cheers from the birders above. 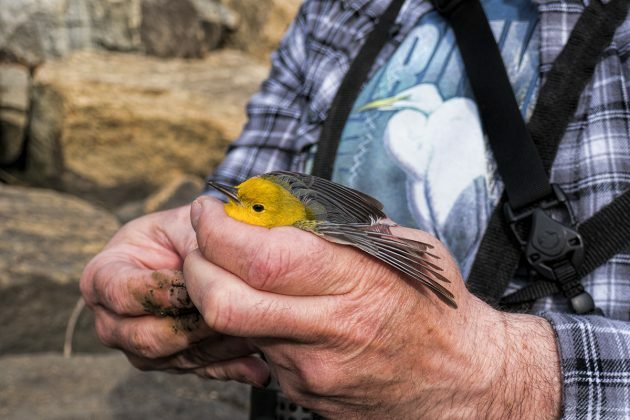 The Prothonotary Warbler just wanted to be free, and then, released, it was. It flew to a tree above the cove where it sat for half a minute before flying again. We walked to the back of the Nature Center where we found the bird in its old haunt, below the patio, a bit further away from the flowers, but feeding and walking, flying a little, and looking healthy. I haven’t found any articles on Atlantic Coast birds being injured by these dangerous mussels (which are also not very tasty to humans), so I’m thinking that our birds somehow know better. And, that ribbed mussels are only a threat in areas where they are invasive and birds don’t have this innate knowledge. 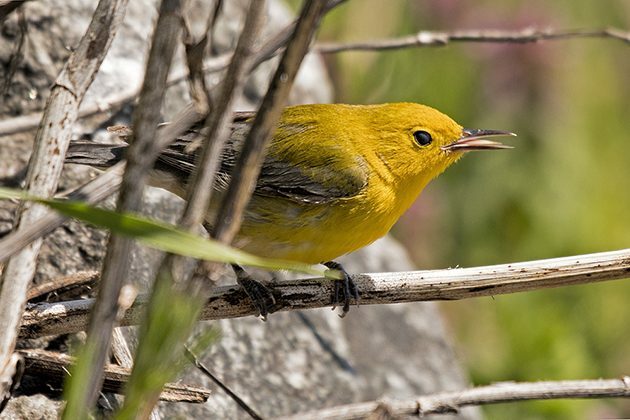 The Prothonotary Warbler, a rare migrant, and one that is not often found in salt marshes, was in the same position as those rails in California. And, to make the injury even worse, it couldn’t even eat the mussels in return! Well–it’s a theory. Meanwhile, our Prothonotary is doing well. The after-photo above shows that one of its toes is not gripping the branch, but more recent photos, taken by birders yesterday and today, display a warbler with fully functioning toes. I hope he has learned his lesson and is avoiding the rocks of the cove and the dangers within. 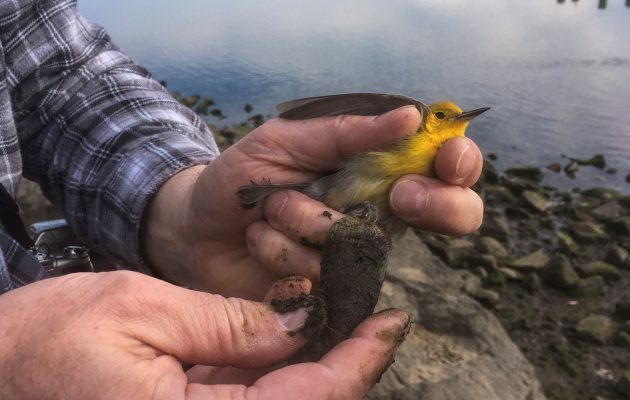 The NYC birding community has expressed much thanks to Eric, Lisa, and the Nature Center worker for saving this beautiful warbler from the ribbed mussels of Brooklyn. Cover photo by and copyrighted by Lisa Scheppke. Thank you, Lisa! ** Torchin, M.E., Hechinger, R.F., Huspeni, T.C. et al. Biological Invasions (2005) 7: 607-614, quote on p. 612. Cool story! Glad the warbler survived the incident. I’m not sure about records of birds on the east coast getting caught by ribbed mussels specifically, but there are quite a few instances of bivalves catching oystercatchers and other birds. My goodness, what a story! Lots of these flying lemons winter in mangroves in Costa Rica. I think the majority have flown north by now. It took me a moment to get the “lemon” reference. I can get to Marine Park by the 21st. What’re the chances it might still be there I wonder? I don’t know, Redgannet, but there’s a report of a Kentucky Warbler today at the Bronx Zoo, so there’s bound to be something good around.